The Russian T-34 medium tank was far superior to the German Panzer III and IV tanks but many were still knocked out by these aging German tanks. Why was that? The Panzer Mark III tank was adequate for the battles that were fought in the North African Desert against British and American made tanks, which were frequently inferior. The Panzer III was not up to the task of being a main battle tank in Russia. Its gun and armour was not as good as its Russian opponents. There had been a number of upgrades that kept the Pz III tank fighting into 1943. Chief among them was the up armouring of the tank. The Ausf. L version of the tank had a long barrelled high velocity 50mm gun that gave the tank more penetration power. This meant that it had just enough punch to deal with a Russian T34 tank at close range so long as it attacked it from the side or rear. What kept the panzer III tank still roaming the battlefield was he superior training of the tank crews and also as the fact that these armoured combat vehicles all had radios. This meant that groups of tanks could coordinate their attacks in a far better way than the Russian T-34 and KV-1 battle groups initially could. When the Russians first deployed tanks they used signal flag as a means of communicating orders and intelligence between the vehicles. Although the Russian tanks could hit harder and tank more punishment the German tank crews could out think and out fight the Russian armoured brigades by working as a team. By the time of the Battle of Kursk the Russian tank crews are much more experienced and radios have started to be fitted to the tank turrets. This is when the Panzer III tank lost its status as a main battle tank. 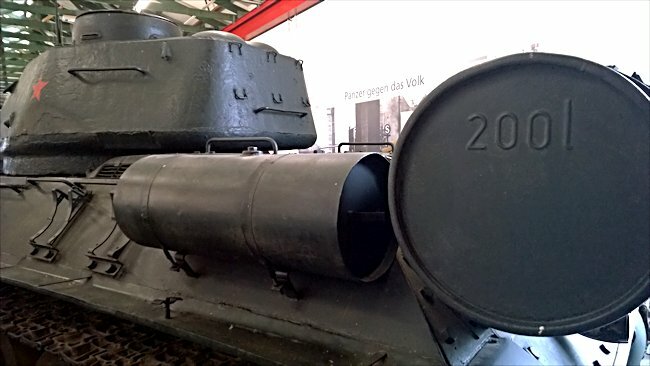 The inability of the T-34 adequately to deal with the new German armour forced the NKTP to accept the fact that major improvements in Soviet tank design would have to be accepted no matter what disruption they caused the tank industry. The GKO intervened, having been deluged by complaints from the field that Soviet tanks needed 'a longer arm' to reach out and smash German armour. Four gun design teams were assigned to a crash programme to field an up-armed T-34. Besides the Grabin and Petrov teams already working on 85mm guns, Grabin's bureau at Zavod Nr. 92 in Gorki was turned over to 23-year-old A. Savin when Grabin was shifted to the Central Artillery Design Bureau (TsAKB) in Moscow, and K. Siderenko's team also began design work on their S-18 85mm gun. The new guns were tested at the Gorokhovieskiy Proving Grounds outside Gorki, where Grabin's ZiS-53 was declared the winner. 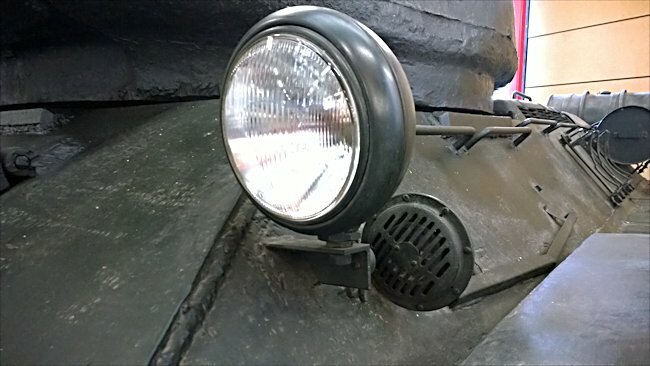 Unfortunately, the new turret, designed by V. Kerichev at Krasnoye Sormovo in Gorki, did not mate properly with the new gun, apparently being designed around Petrov's D-5 gun which had been available earlier since it was already in production for the SU-85. 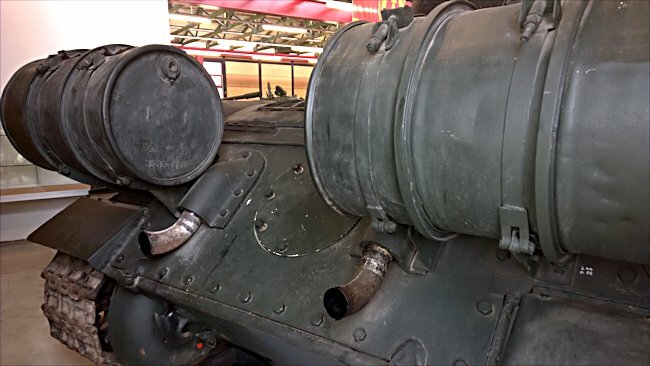 The T3-4/85 Russian Soviet WW2 Medium Tanks used in WW2 were normally fitted with four 90 litre external fuel tanks two on each side. Two unarmed T-34-85s were completed on 15 December 1943, and the GKO approved the type for Army service despite the problems. To circumvent any further delays, the NKTP ordered the T34/85 into production on an interim basis, using the runner-up D-5T gun. This entered production at Zavod Nr. 112 Krasnoye T-43, Sormovo in December 1943. In the meantime, Grabin's gun was adapted to fit the new turret by Savin, who incorporated other improvements. The modified gun was designated ZiS-S-53, in acknowledgement of Savin's contributions to the design. It supplanted the D-5T on the new T-34/85 Model 1944 in the spring of 1944. The T-34/85 Model 1943 and T-34/85 Model 1944 differed in a number of respects. The most obvious external difference was the gun mantlet, but the Model 1944 also had the commander's cupola moved back to give more room to the gunner and to allow the radio to be moved from its previous position near the hull machine-gunner up into the turret in front of the commander so that he had more control over it. 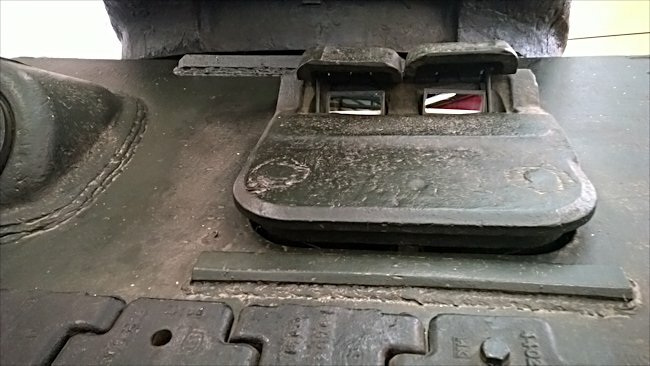 The T-34-85 represented not only an important leap forward in firepower, but finally the T-34 turret was reconfigured for a three-man crew with full vision facilities for the tank commander and with full radio equipment. 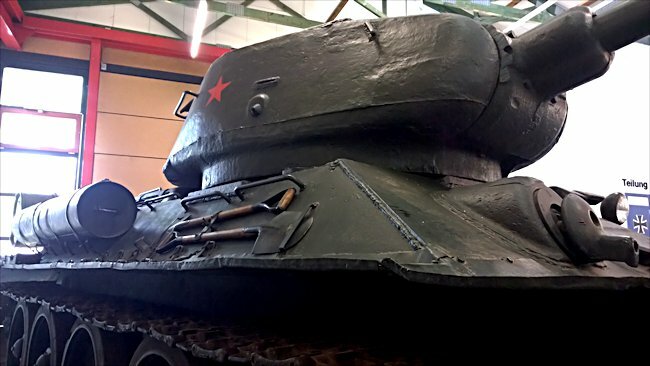 T-34/85 production did not completely supplant production of the T-34 Model 1943 armed with the 76mm gun at all factories, but did make up the bulk of the 1944 production. It was initially misidentified by the Germans as the T-43, which has led to some reports that the aborted, up-armoured T-43 had been in action, which in fact was not the case. In October 1943, the NKTP finally cancelled any further light tank production after only 120 T-80s had been built. By this stage in the war, they were completely inadequate against German tanks, and remaining requirements for scout tanks could be satisfied by existing inventories and Lend-Lease shipments of such types as the Valentine. In connection with this decision, in November 1943, the tank brigades were again reorganized: all light tanks were removed from the table of equipment, and the new brigades were composed solely of T-34/76s and T-34/85s. The mixture of T-34/76 and T-34/85 was arbitrary depending upon what type was available, though guards units were favoured with the better equipment when possible. Light tanks were retained in mechanized artillery units and some other formations for scouting and liaison duty.